Ryparken is an area in the northern part of Østerbro, Copenhagen. Close to the ethnic and diverse neighborhood of Nørrebro, yet still in the 2100 Østerbro zip code, Ryparken defies easy definition. The area is well connected both by buses and by the S-train Ryparken station, formerly known as Lyngbyvej station until 1972. Trianglen is a central junction and public space in the Østerbro district of Copenhagen, Denmark. Five streets meet in the junction, Blegdamsvej, Øster Allé, Østerbrogade, Trianglen will be a station on the City Circle Line of the Copenhagen Metro. Lille Trianglen is located some 400 metres to the south, along Østerbrogade and it is the junction of Østerbrogade, Dag Hammarskjölds Allé, Classensgade, Øster Farimagsgade and Østergade. The hospital Vartov was from 1630 located at the site and its fortified building was part of Christian IVs defense of Copenhagen. The East Road passed through the complex consisted of four wings surrounded by ramparts and moats. The building was destroyed during the Swedish siege of Copenhagen in 1658, the sites importance as a junction outside the Eastern City Gate was consolidated when Øster Allé and Blegdamsvej was expanded in 1750. In the 19th century, Trianglen was a hub for carridges which drove north to Jægersborg Dyrehave. Strandvejen Steam Tramway Company opened a route between Trianglen and Klampenborg in 1884 but it was discontinued in 1892, two buildings bear testament to Trianglens history as a hub for trams. Randersgade is a street in the Østerbro district of Copenhagen9, linking Nordre Frihavnsgade in the south to Strandboulevarden in the north. The small square Bopas Plads is located on the corner of Randersgade with Viborggade, Randersgade was originally called Kalkbrænderivej which linked Trianglen with the two lime plants. 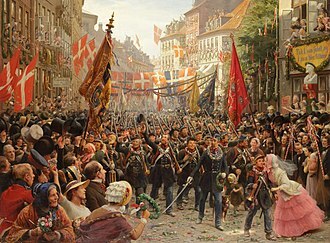 The name Randersgade was introduced for the section from Nøjsomhedsvej to Århusgade in 1886, the new name was in accordance with a naming scheme introduced by Thorvald Krak which would name streets in the area after Danish market towns. In 1904, the name was adopted for the section north of Vordingborggade. The two parts were not connected until 1928 when the factory had been demolished and the section from Nordre Frihavnsgade to Nøjsomhedsvej was included in the street. The Luther Church was built in 1914-18 to design by Martin Nyrop, the name commemorates the 400-year anniversary of the beginning of the Lutheran reformation in 1918. Outside the church stands a statue of Martin Luther, No.10 was from 1880 home to the Royal Orphanage.